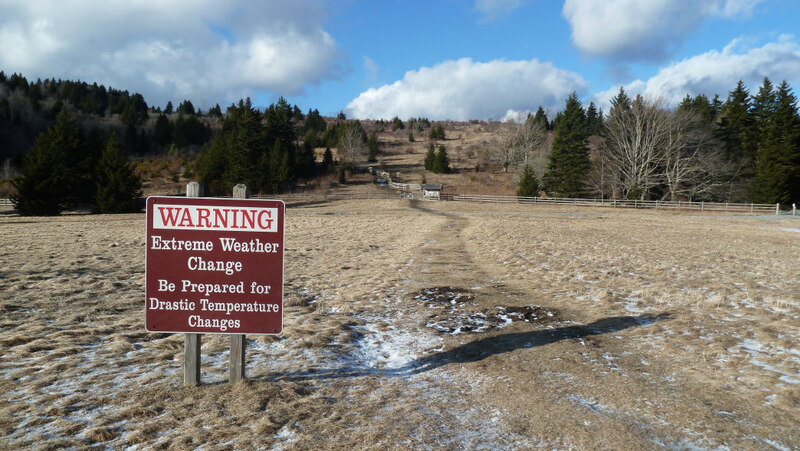 Even during the most docile of months, weather on high altitude balds surrounding Mount Rogers National Recreation Area deserves respect. Wind gusts topping fifty miles per hour and pop-up thunderstorms unnerve park explorers even while residents in nearby towns enjoy perfect bluebird days. 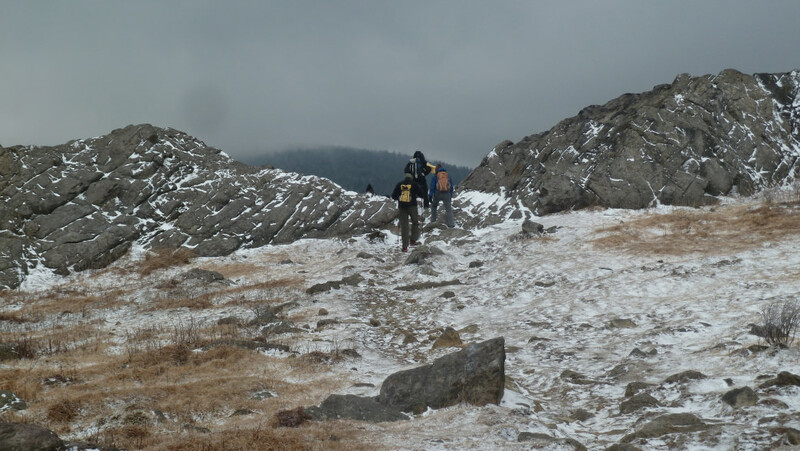 So bagging the highest peak in Virginia in the dead of winter can be a true test of will and cold weather gear. The payoff for such fortitude is tremendous. Rocky plateaus and wild ponies—signature highlights of the area—are shown in stark relief to open meadows and stands of Frasier Firs dusted with a fine blanket of snow. When describing the hike to the top of Mt. Rogers, the phrase: “It’s the journey, not the destination,” certainly applies. The half-mile Mount Rogers Summit path leads hikers from the Appalachian Trail to a pleasant, albeit somewhat anti-climactic, 5,728 foot peak. A humble USGS survey disc implanted in a rock quietly denotes the highest point in the state. Fir and Red Spruce, which cover the top of Mount Rogers, mercifully block the lion’s share of freezing winds but also any hope of sweeping vistas from the summit. As such, this makes for more of a peaceful forest walk than the grand finale finish you may have hoped for with reaching the highest point in the entire state. The hike to the Mount Rogers Summit Trail is an entirely different story. Most hikers begin the trek to Mt. Rogers from the parking lot at Massie Gap in Grayson Highlands State Park. At 4,600 feet above sea level, it’s common for temperatures here to be 15 degrees colder than in nearby towns (and 30 degrees colder than Charlotte). 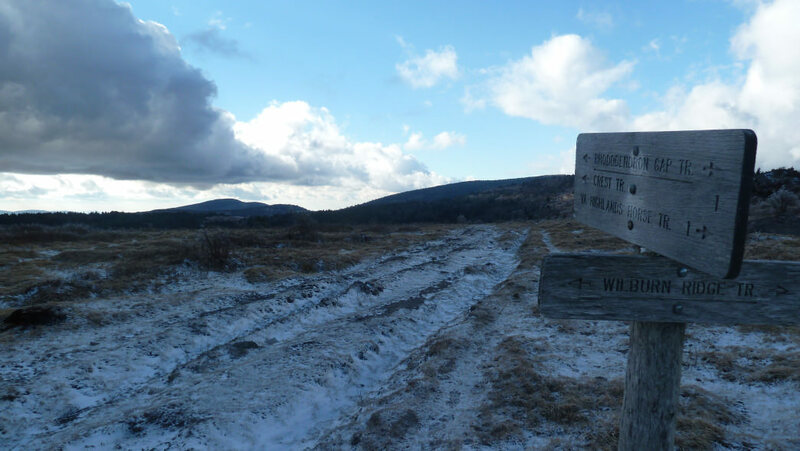 The deforested meadow of Massie Gap allows frigid winds an unfettered path directly through open car doors and up the legs of hiking pants, forcing one to question the sanity of walking in such elements. You don’t have to wait for long to get the answer. The first highlight of the hike is just a few minutes along the Rhododendron Trail. Granular white powder swirls, whips, and eddies across the meadow. 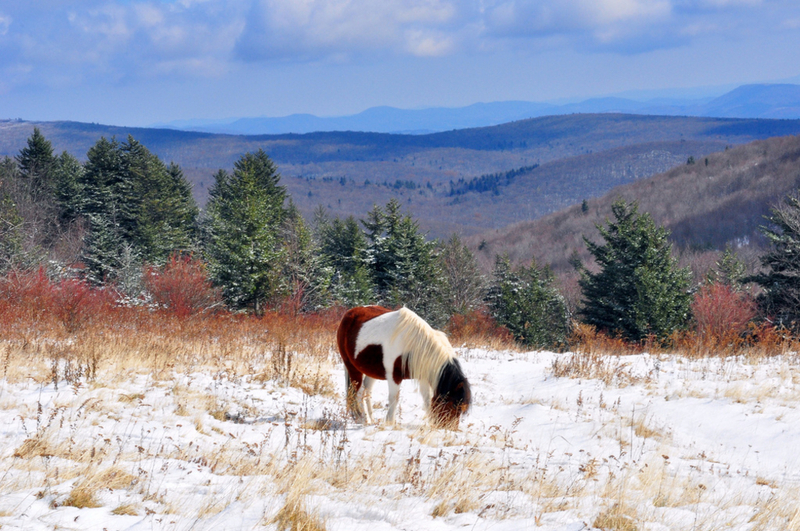 A small heard of half-size horses lazily graze on sparse grass, which has pushed its way through the thin blanket of snow. 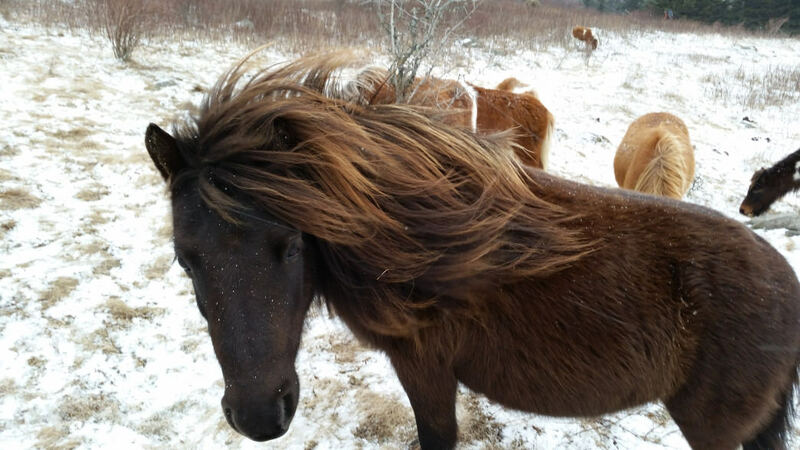 The ponies, with shaggy winter manes blowing furiously in the wind, are dynamically photogenic. The ponies were first introduced in 1974 to graze the park’s balds. During winter, many of the mares carry next spring’s foals while being attended by last year’s offspring. To keep the herd at a healthy size, some foals are sold at auction during the yearly Grayson Highland Fall Festival . While the ponies have a large swath of land to roam inside the park, it’s quite common to see them near the trail. If you miss them on the way out, it’s possible they’ll be waiting for you on your return walk from the summit. The Rhododendron Trail dead ends at the AT. Turn left and head southbound along a more rugged section of the trail. Soon, you’re climbing to rocky plateaus that must have made the Scottish highlander immigrants of the 1700’s feel right at home. Completely exposed, high velocity wind gusts roar past your head and snow blows sideways all around. Fast moving clouds fly across an impossibly huge sky, alternatively painting the surrounding hills in a playful combination of shadow and light. Continue on the AT for a few miles, moving from exposed rock to guarded forest and back again. The Mt. Rogers Summit Trail breaks off to the right, a perfectly placed respite from harsh winds and blowing snow. Return to Massie Gap the same way for another visit with the ponies. While in total the round trip hike is only nine miles, the cold, wind, and rugged terrain may make it feel much longer. 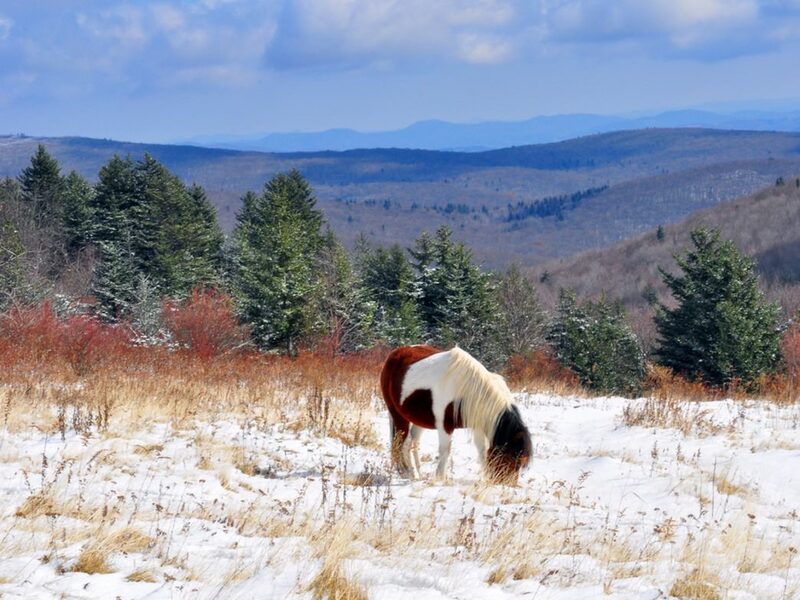 After warming up in the car, your hiker’s memory will kick in and thoughts of chilled fingers and icy beards are overrun by memories of amazing views and picture perfect ponies. If you’re lucky, someone in your group has brought the Jet Boil and hot cocoa. Distance: 9 miles round trip to the summit and back. If time is short, many of the best highlights are in the first couple miles. Trailhead: Backpackers Parking lot, Massie Gap, Grayson Highlands State Park. About 2.5 hours from both Charlotte and Asheville. 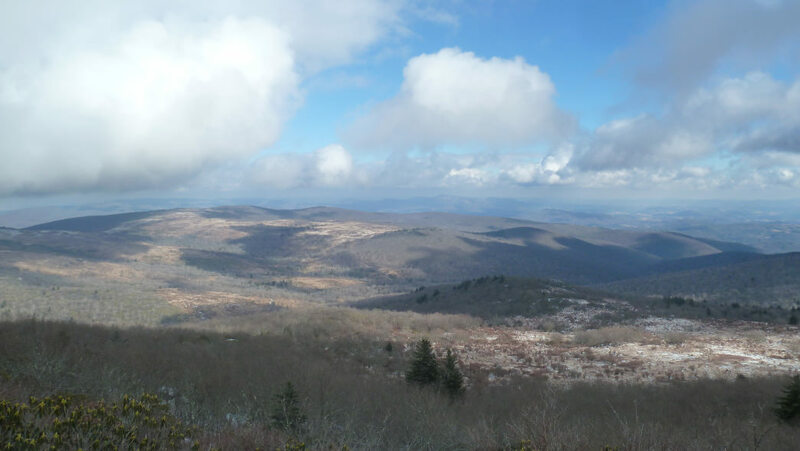 Hike: Rhododendron Trail, left on the Appalachian Trail, right on the Mt Rogers Summit Trail and back the same way. The hike leaves Grayson Highlands S.P. and enters the Mt Rogers National Recreation Area. Weather: It can be serious on the top of the bald. Watch weather reports before visiting and be prepared for cold and wind even on calm days in surrounding areas. This is not the place to be during thunderstorms.